Ernie Pyle came to Indiana University to study journalism in 1919 but left in his senior year without a degree. Some say it was because of a romance. Some say it was because he had a job offer at the La Porte (Indiana) Herald. In any case, he worked at La Porte for only a few months before going to Washington, D.C., to join the staff of the Washington News, first as a reporter and eventually as its managing editor, a job he never liked. What Ernie Pyle did like was writing. In the 1930s he became a roving reporter for Scripps Howard Newspapers, traveling widely and writing a column about the lives of ordinary folks coping with the Depression. He was already a popular journalist, noted for his humor and humanity, when the United States went to war in the 1940s. His popularity soared when he traveled to Europe and later to the Pacific to write about the lives of ordinary soldiers coping with war. For many at home, Ernie Pyle's columns were the real story of World War II-the story of sons and husbands living a deadly adventure day by day in a foreign land. Ernie Pyle came back to Indiana University in 1944. He visited with students working at the Indiana Daily Student, a newspaper for which he had once served as editor-in-chief. The university presented him with the first degree of Doctor of Humane Letters it had ever bestowed. Shortly afterward, he made arrangements to join the American armed forces fighting in the Pacific. 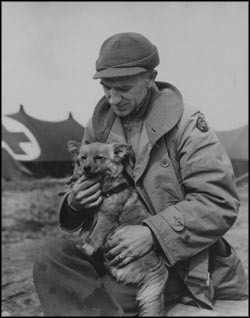 Ernie Pyle died on the Pacific island of Ie Shima on April 18, 1945. A sniper fired at his jeep and Pyle took cover in a ditch. He raised his head to look for one of the soldiers who was with him and he was killed instantly. Ernie Pyle Hall is the only building on campus named for a student. And for us who study here, he will always be a student-always working on that elusive bachelor's degree, always editing the student newspaper, always admonishing us to write about the people who matter, not the people who think they matter.